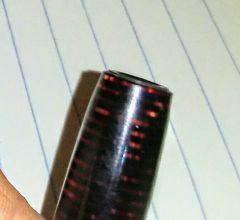 This isn't a Sheaffer product, but it reminds me of the material that is sometimes called Screaming Souls of Purgatory. Of course, the red bits and the lighter add to the flaming and screaming! Also found this one at the garage sale last weekend. Nice condition with no plating loss, no brassing, no dents. 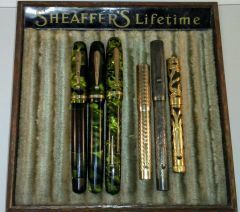 I don't collect Sheaffers, but I couldn't pass up this one! Found this at a garage sale last weekend. It's missing a few of the endy bits, but it's in nice shape. 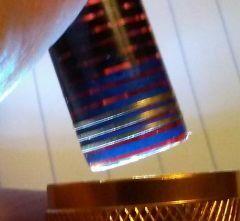 Any ideas as to how to get the blue (ink residue?) out of the cap...? 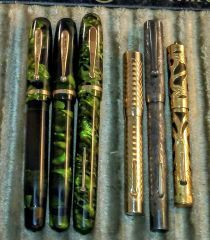 I recently picked up an awfully nice little Gucci sterling and gold cased ballpoint pen and thermometer. The pen is marked Gucci, Made in Italy, Sterling 925 (and a hallmark I cannot quite make out). The 925 and hallmark are on the case, too. The thermometer is marked Made in England. 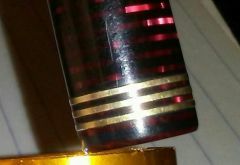 The gold bits look like they might be solid gold and the hallmark looks like it "might" be 585, making it 14K, but I'm not sure. Has anyone seen one of these? I searched and can find no records or references.